An expedition in the 1800's with the promise of many, many months at sea sounds somewhat tedious. But take said expedition and amp it up with eight top scientific and artistic minds... Things just got a lot more interesting! 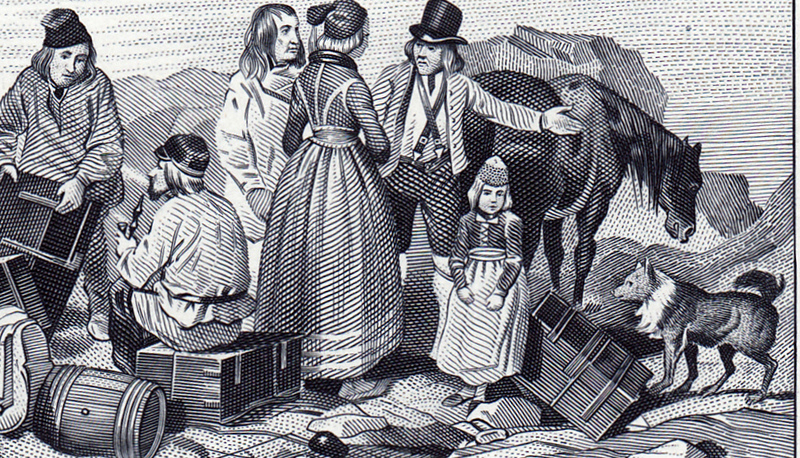 In 1836 the Gaimard expedition set off to explore Iceland and Greenland on the ship La Recherche. Not only was this a research expedition, it was also a search and rescue mission for explorer, Jules de Blosseville, who disappeared a few years earlier in Arctic waters. Among the eight members of the expedition were a naturalist and surgeon, a physicist and cartographer, a linguist, a geologist, a meteorologist, and two artists, one specialising in fauna and the other in landscapes and naval scenes. For the purposes of this blog, two of these men are worthy of note. The first is Paul Gaimard, a French Naval surgeon and naturalist who wrote about the expedition. 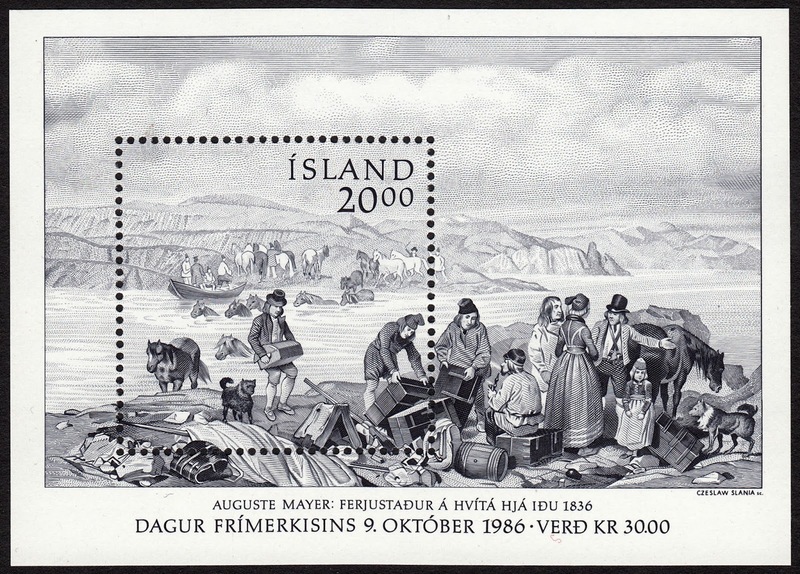 In fact he wrote a nine volume work entitled: Voyage en Islande et au Groënland. This series, which included many illustrations, was then considered the definitive study of the islands. The other participant of note for us is Auguste Mayer, a French artist who taught drawing at the École Navale. He painted many beautiful naval scenes. One particularly amazing painting was his depiction of The Battle of Trafalgar, entitled: Scene de la bataille de Trafalgar. This painting is housed in the National Museum of Paris. 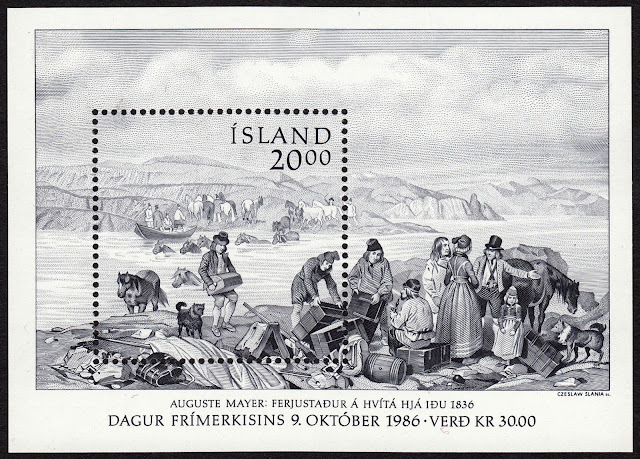 On 9 October 1986 Iceland issued a stunning Souvenir Sheet for Stamp Day. 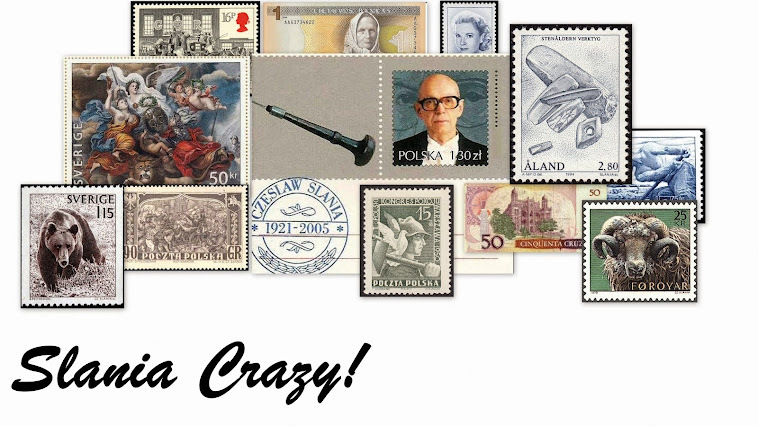 It was designed and engraved by Czeslaw Slania. This impressively intricate engraving was based on a drawing by the artist, Auguste Mayer. The drawing was published in Paul Gaimard's book, mentioned above. The scene depicts a group of people and horses at a crossing in the Hvita River. This river, which starts as a glacial lake and plummets down a gorge into the lowlands, is susceptible to winter flooding. Because of this it has a reputation as one of Iceland's most treacherous rivers. The details in this composition are magnificent. From the rolling hills in the background to the horses crossing the ford. And from the people in various action poses to the luggage and other ephemera strewn across the barren ground. comment faisait C. Slania pour graver aussi bien ?? bel article Matt .